That time all four tires and rims got stolen off a tourist’s rental car, and we spent the whole weekend working out how to get them back on the road. The schools we’re helping to build in South America. The best thing to do when your vehicle slides on ice. The difference in stopping distances between worn and new tires. At Kal Tire, we’ve got a lot of stories, and a lot of expertise. And we think it’s time to share that with you. 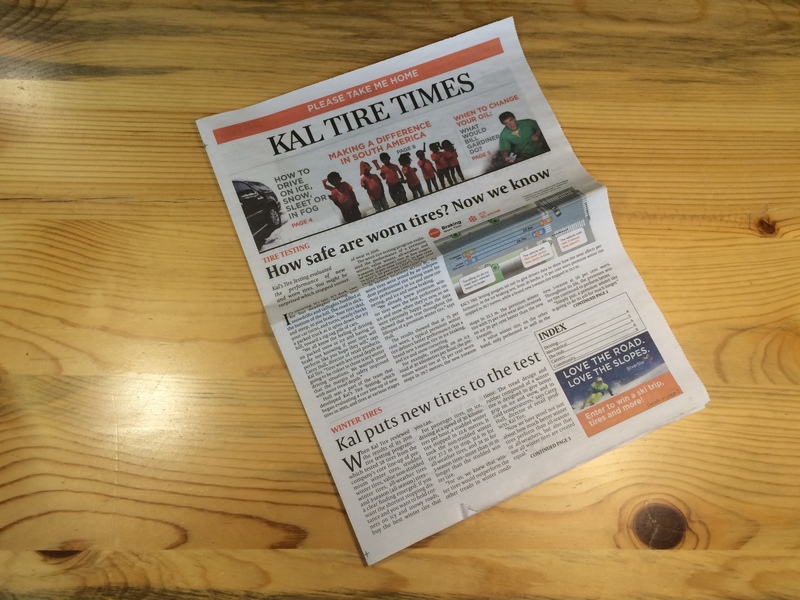 Introducing Kal Tire Times, our very own newspaper! This fall, at Kal Tire locations across Canada, customers will be able to pick up (and take home) their very own copy of our first edition. Our team members do so much more than change tires. We help people who are stuck or stranded with flat tires. We raise money for local and national charities. We fix brakes. We share what we know about driving, about the elusive inner-workings of vehicles. We test tires to give drivers data about how tires really perform when push comes to shove. And so much more. To us, the Kal Tire Times is a way to educate drivers to help make our roads safer and vehicles perform better, a way to celebrate team members going above and beyond. 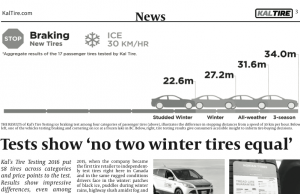 What better way to learn more about your tires, driving and your vehicle than in a newspaper? Kal’s Tire Testing evaluates the performance of new and worn tires. You might be surprised which stops sooner. 58 new tires across categories and price points were put to the test. Results show impressive differences, even among winter tires. 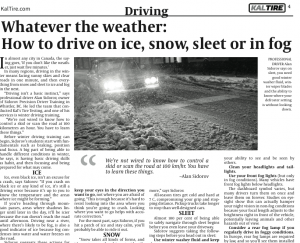 Renowned professional driver Alan Sidorov shares insider tips for driving in Canada’s most scary winter conditions. When to change your oil: What would Bill Gardiner do? Beloved automotive TV personality Bill Gardiner tells readers which oil service interval they should actually pay attention to. Fun stuff, like a crossword and comics. Have you ever heard the joke that goes: So a tire walks into his shrink’s office….? It’s pretty good! Mission impossible: A true service story about how a Kamloops team member completely wowed a stranded British tourist. 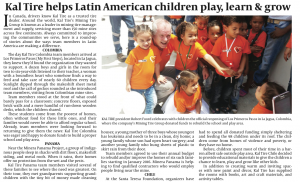 Kal Tire helps Latin American children play, learn & grow. Did you know Kal Tire’s Mining Tire Group employs 1,800 team members who help serve 150 mine sites across five continents? And that each of those regions does amazing things to support the communities we serve? No? Well, here’s a story about how we did some cool projects for children and families in South America in 2016. There’s a contest. And you could win a ski trip, a set of tires and more! We’re hiring! Find out if we’re looking for someone like you in the Careers section. It’s free and you can take your copy home from the store. Of course, if there’s a specific topic you want more information on, and it’s not in the newspaper or you don’t have your copy handy, there’s a pretty good chance we’ve got an article for you in our Resource Centre.